During the Union Conference in Cape Town there was an opportunity to meet and greet some of KNCV’s most prominent experts. Jerod Scholten, Frank Cobelens, Eveline Klinkenberg, Jeroen van Gorkom, Suzanne Verver, Michael Kimerling, Kathy Fiekert all took turns in being present at the KNCV booth. One pilot after another: How can we move up towards a sustainable scale-up of child lung health interventions? 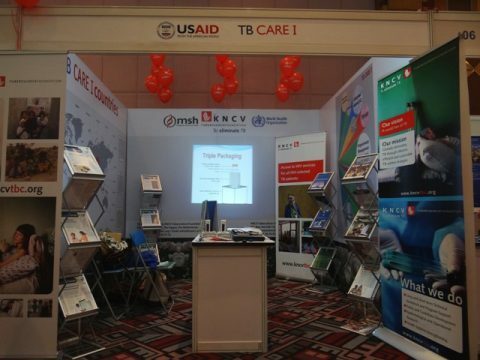 Discussion: What do these survey results mean for TB and HIV programs in Africa? Presenters: Job van Rest and Kathy Fiekert. Introduction of out-patient care for DS-/MDR-TB patients in Tajikistan. Four degrees of separation: the influence of social and provider networks in the steps to diagnosis of active tuberculosis in urban Uganda. Patient and provider delay in pulmonary tuberculosis patients: a cross-sectional study in Addis Ababa city, Ethiopia.